The global n-methyldiethanolamine (MDEA) market is prognosticated to bountiful growth, according to a report by Transparency Market Research (TMR). The market’s business landscape comprises of a number of established as well as new players. 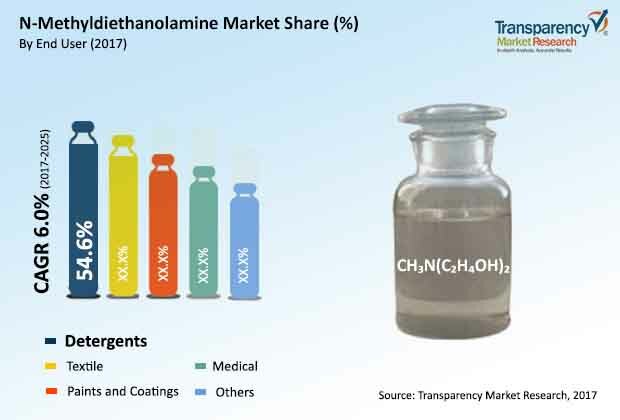 Vendors in the global n-methyldiethanolamine market are anticipated to engage in various organic and inorganic strategies in order to gain revenue and shares. Collaborations and partnerships are one of the primary strategies taken up by vendors in this market. Expansion of production capacities is anticipated aid players in the global n-methyldiethanolamine market to leave a footprint in the competitive landscape. Vendors are also seen focusing on improving their distribution channels across the world. Leading vendors in the global n-methyldiethanolamine market include Eastman Chemical Company, Amines & Plasticizers Ltd., BASF SE, and The Dow Chemical Company. TMR predicts that the global n-methyldiethanolamine market will expand at CAGR of 6.0% during the forecast duration 2017 to 2025. The market was estimated to be worth 565.61 Mn in 2016, and is forecasted to reach US$ 951.59 Mn by 2025-end. High demand from different industrial applications will push the gas sweetening process segment over the forecast period. Geographically, Asia Pacific is projected to emerge as a leading regional market for n-methyldiethanolamine. This could be on account of the region currently holding nearly two-fifth share of the global market revenue. The synthesis of numerous products uses N-Methyldiethanolamine as an intermediate. Its unique chemical products have been used in a number of areas, including coatings, textile lubricants, polishing products, detergents, pesticides and personal care products. The toxicity of the product is low. No major side effects are caused in humans. On the following regulation agencies: AICS, IECSC, ECHA, EPA, and NFPA, N-Methyldiethanolamine was listed. Currently there are not a number of N-Methyldiethanolamine side-effects or toxic effects, however if negative health issues are detected, they will be restricted or banned in the future. N-Methyldiethanolamine is an important application of gas treatment. MDEA's demand is higher than 50% in the oil and gas industry. It is expected that the expansion of the gas treatment segment worldwide will increase MDEA demand globally. As a result, the increasing demand for gas sweetening or a process of amine gas treatment drives the market for N-methyldiethanolamine. Population growth and better living standards led to increased demand for textiles, paints and medical products. MDEA is commonly used in fabric softeners as an active agent and a good alternative to TEA esterquats. MDEA can be used to modify acrylic polymer dispersions cationically in the paints industry. For the production of silicone based textile finishing agents, MDEA is used in combination with perfluoroalkyl polymers. Finally, MDEA is used as a precursor in the medical industry to certain active substances. N - Methyldiethanolamine is not an amine product that has been widely used, however, in specific applications, the requirement for N - Methyldiethanolamine is high. While the product may face some limitation in terms of industrial risks and handling concerns, they may be overcome by the opportunities presented by wide berth of applications. Our reports are single-point solutions for industries to grow, evolve, and mature. Our significant-time data collection methods along with ability to track more than one million high growth niche products are aligned with your aims. The detailed and proprietary statistical models used by our analysts offer insights for making right decision in the shortest span of time. For organizations that require specific but comprehensive information we offer customized solutions through adhoc reports. These demands are delivered with the perfect combination of right sense of fact-oriented problem solving methodologies and leveraging existing data repositories. TMR believes that unison of solutions for client-specific problems with right methodology of research is the key to help enterprises reach right decision.